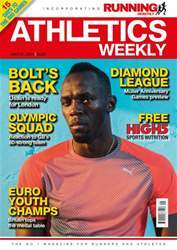 Digital Subscriptions > Athletics Weekly > 21/07/2016 > BRING ON RIO, PLEASE! WITH THE athletics in Rio getting underway just 20 days after this weekend’s “Muller Anniversary Games” Diamond League, I’ll be relieved when the first event in Brazil commences. It’s been a summer of distraction, the newswires dominated by negative and awkward issues, of doping, hyperandrogenism, Bolt’s “injuries”, the Zika virus, crime levels in Rio, past IAAF corruption, occasionally Brexit, and … did I mention Russian doping? After recent events in Nice, everything pales in to relative insignificance of course, but the greatest honour we can each do in respect of the victims is get on with life as usual, to live life to the full. For the intense hatred and resentment that fuels the terrorist outrages, the best counter-activity counter-activity for we masses is to celebrate good health through sport, something that promotes equality, fairness, respect and humility. Being powerless is awful, but we can each do our bit by improving and intensifying what we already do, a kind of “democracy of life”.